For the third year, the Creative Art Series is enhancing student learning and broadening public perspectives through art, music, film and theater. Each visiting artist in this School of the Arts series offers a master class workshop for students and presents a public performance. The series also includes events by St. Cloud State students and faculty. 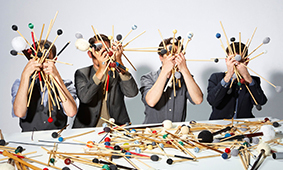 Third Coast Percussion will present a concert exploring and expanding on the extraordinary sonic possibilities of the percussion repertoire. The group delivers exciting performances and has developed an international reputation of inspiring energy and subtle nuance through its concerts and recordings. Third Coast Percussion is known for enhancing its performances with cutting-edge new media, including Apple apps that let audience members create their own musical performances and experience a deeper look at its music. The 51st Annual Student Art Exhibit will showcase student artwork from projects throughout the academic 2016-2017 school year. 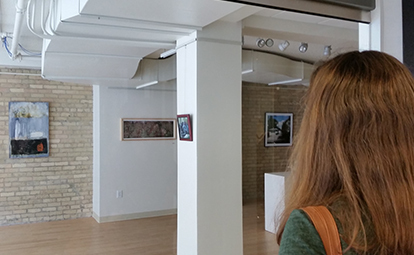 This juried exhibition at the Gallery St. Germain in downtown St. Cloud hosts 26 works by St. Cloud State alumni. The works were selected by juror Michael Strand '94. The artists were feted at a Sept. 16 Celebrate St. Cloud State reception. View photos of selected pieces. Free event. Presented by the School of the Arts. 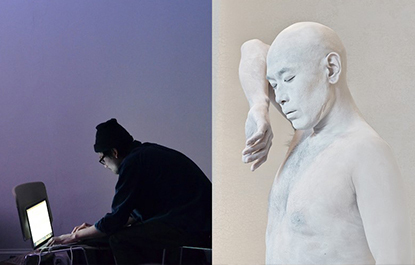 Butoh artist Gadu Doushin and Minneapolis-based composer and artists Michael Flora present “nothing,” their new work for sound and movement as part of the Creative Art Series. Doushin will explore movements and space to complement Flora’s digital synthesis and acoustic music as it explores a play of colors, textures and overarching shape. “Nothing is not anything; something that does not exist; someone or something of no value or size; nothingness; nonexistence; absence of quantity; void; zero. In the instance of this performance, nothing could refer to an absence of suggested meaning. Free event. Presented by Department of Theatre and Film Studies. 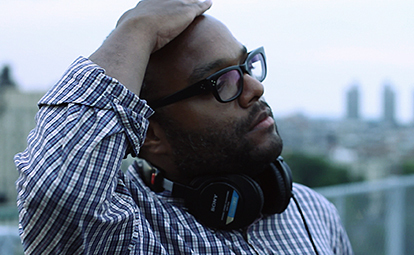 Accomplished filmmaker Moon Molson presents three of his short films — “Pop Foul”, “Crazy Beats Strong Every Time” and “The Bravest, the Boldest” as well as his sci-fi drama production “Advantageous” 7-8:30 p.m. Sept. 30 in the Miller Center Auditorium. The three short films have been shown at some of the best festivals around the world and won more than 100 awards. His films have been shown at Sundance Film Festival and at more than 250 international film festivals. A question and answer session will follow the screening of the films. Moon Molson is an accomplished filmmaker with extensive experience making and promoting short films. He is an assistant professor of film and media arts at Temple University in Philadelphia and is the filmmaker in residence at Maryland Institute College of Art in Baltimore. In addition to showing his films, Molson will sit down with film studies students in a filmmaking master class, where he will discuss the process of making his most recent short film. Molson will lead a filmmaking master class from 1-5 p.m. Sept. 30 in the Miller Center Auditorium. During the master class, Molson will discuss the process of making his most recent short film. Waayaha Cusub, a performance group of Somali artists, will bring Somali culture to life through music. 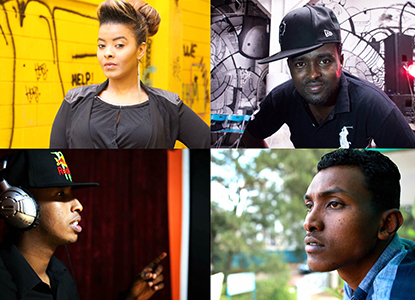 The group is made up of Somali artists from Minnesota and around the world. The Creative Art Series is partnering with The Cedar Cultural Center’s Midnimo project to bring Waayaha Cusub to the Paramount. Midnimo means unity, and the Midnimo project connects Somali singers with local musicians to transcribe Somali music into western notions and flies Somali musicians from different parts of the world to perform with the featured artists. Tickets are $20 in advance or $25 at the door. Presented by the School of the Arts. The Student and Alumni Film Showcase is kicking-off the first day of the Nov. 5-12 St. Cloud Film Fest. St. Cloud Film Fest supports filmmakers through the annual festival and year-long outreach. Films of various genres are screened, including live action, animation, documentary and avant-garde. Tickets for the Student and Alumni Film Showcase are free for students with a St. Cloud State ID, $5 for the general public or $25 for entrance to all the shows in the week-long film festival. Presented by the Department of Theatre and Film Studies. St. 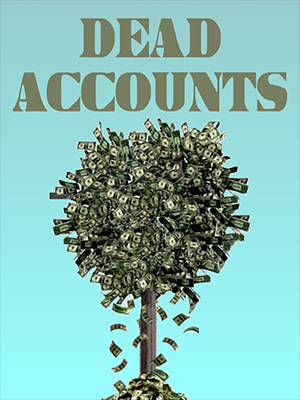 Cloud State theatre department presents “Dead Accounts,” a comedy by Theresa Rebeck first performed on Broadway in 2013. The play begins when Jack’s unexpected return throws his family into a frenzy, and his sister Lorna needs answers. Is he coming home or running away? Where is his wife that everyone hates? And how did he get all that money? The comedy tackles timely issues of corporate greed, small-town values and whether or not your family will always welcome you back … with no questions asked. Free with a St. Cloud State ID. Presented by the Department of Theatre and Film. Anna Rose Holmer screens her most recent film The Fits from 7:30-9:30 p.m. on Feb. 15 in the Performing Arts Center, Ruth Gant Recital Hall. 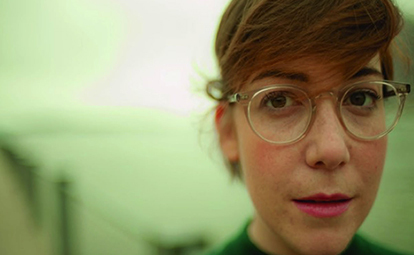 The film tells the story of a tomboy living in Cincinnati who joins an all-girl dance team. The screening will be followed by a Q&A. Holmer will also teach a master class in the Performing Arts Center, room 101 from 4-6 p.m., prior to the screening. Free event. Presented by the Department of Theatre and Film. 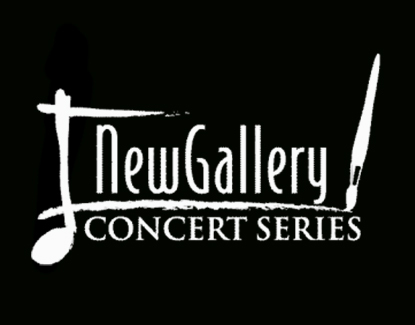 The New Gallery Concert Series will bring new music and visual art to St. Cloud State. Since its start in 2000, the series has featured works spanning the spectrum from classical-contemporary, improvisation, electronic music, jazz, folk, art song, opera and avant-garde. Visual arts have included sculpture, painting, indoor installations, photography, graphic and children’s book illustrations, visual music, video art and film. The series’ goal is to build a unique community that encourages interactive collaborations between musicians, visual artists and audience members. Its programs are cohesive, diverse, exciting and intimate. Peter Happel Christian is a photographer who makes sculpture, installations and books. He has exhibited his work nationally and internationally at venues including The Minneapolis Institute of Arts, Law Warcshaw Gallery (St. Paul), Ditch Projects (Oregon), Fototropia-La Fototeca (Guatemala), Tucson Museum of Art, Johalla Projects (Chicago), and Higher Pictures (New York). He has received grants and fellowships for his work including a Central MN Arts Board Artist Career Development Grant, MN State Arts Board Artists Initiative Grant, McKnight Foundation Artist Fellowship, Chrysalis Focus Fellowship, Ansel Adams Fellowship from the Center for Creative Photography and numerous research grants from St. Cloud State University. He regularly collaborates with other artists, designers and writers on various projects and printed matter. His books can be found in collections such as the International Center for Photography Library (New York), Midway Contemporary Art Library (Minneapolis) and the John M. Flaxman Library Special Collections (Chicago). His first monograph, Half Wild, was published by Conveyor Editions in 2014. 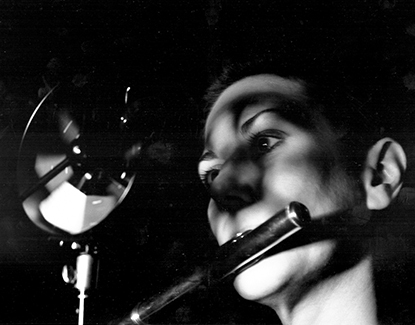 Barbara Held and Benton C. Bainbridge will perform a live concert on flute, Moog synthesizer, and live electronics. Video footage of their interactions and their subtle visual cues to one another as they perform will be projected live across several channels in the gallery space. The audio and video from the performance will continue as an audio/visual art installation, with this footage transforming over the course of the exhibition using software written by Bainbridge. Held and Bainbridge’s duo pairs acoustic and electronic sound with analog image. Their live shows and studio work are composed using Eurorack video modules and a small Moog synthesizer modulated with acoustic flute sound. Free event. Presented by the the Department of Art and the Department of Music.